Jersey Reds are hoping to increase the number of locally born players in the island club's Championship side. The islanders, who won promotion to the second tier in 2012, currently have no Jersey-born players in their squad after James Voss left last summer. Eight local players have played in the second tier for Jersey. 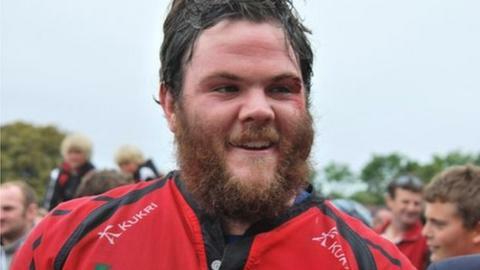 "The great thing would be to have five or six Jersey boys playing for the Reds," Jersey's community rugby officer Joel Dudley told BBC Sport. Jersey's most well-known locally bred player is Gloucester's former England back Matt Banahan, but he left the island before Jersey made their ascent up English rugby's pyramid. Michael Le Bourgeois, who currently plays for Wasps, was the first academy player to be given a professional deal at the club. The likes of Dave Felton, Luke Stratford, Nick Trower, Myles Landick, Ed Dawson, Jack Burroughs and Jon Brennan all played in the second tier for Jersey during their early years in the Championship. "There has to be that talent on the island," added Dudley, who retired from his role as a scrum-half with Jersey through injury last summer. "It's just making sure there's a pathway from when they get to about 15 or 16, that they still have that bug and then there's an position for them at 18."